Rich soil. Well-drained light but deep soil preferred. Beans, Broccoli, Brussels Sprouts, Cabbage, Cauliflower, Kohlrabi, Lettuce, Lovage, Marjoram, Peas, Potatoes, Spinach, Silver Beet, Onion and Onions. Best direct sown in final position . Thin seedlings to at least 10cm (4 in) apart to grow large roots. Each seed is actually a small cluster of seeds, so space well and may require thinning. 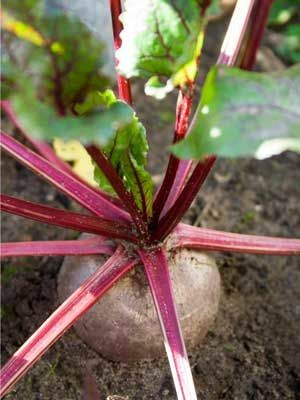 Be careful not to damage the beet when weeding. Young leaves are also a colourful addition to salads. Liable to bolt (run to seed) if sown too early, though some varieties are resistant to this. Harvest young leaves for salad greens as you thin young plants. Pull roots when they become plump. To keep through winter, harvest plants, cut off the tops, and keep in a cool cellar or refrigerator.